Hi everyone! 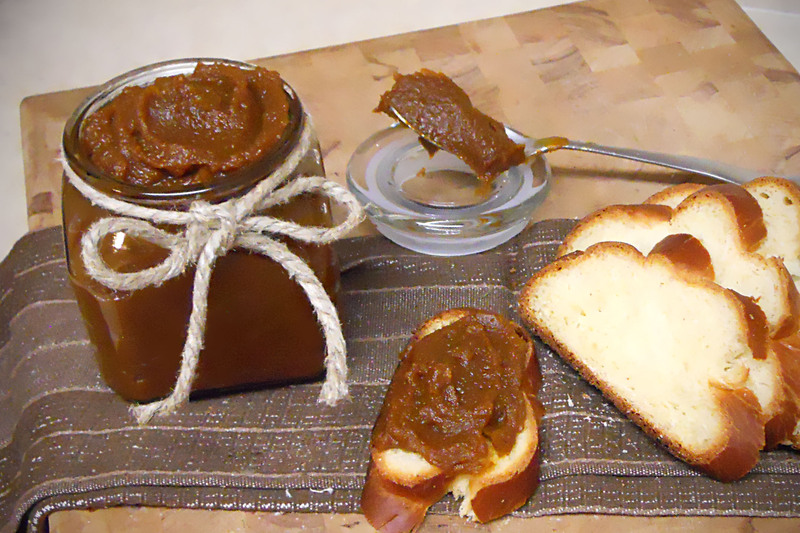 Most of us remember having apple butter in the fridge growing up, but have you ever had the pleasure of tasting pumpkin butter? Oh my goodness! The first time I tried this it was like having dessert for breakfast. What a treat! It is pumpkin pie in a jar and what can be better than that? The scent of warm, sugary, pumpkin pie spices are throughout my apartment making it seem as though I have been churning out pumpkin pies all night. I promise it was much easier than all that! All you will do is place all of the ingredients into the crock pot and wait. Then you too will have all of this yummy, wonderfulness! By the way, this will be great with last weeks challah. So here is the recipe. ENJOY!!! Place all ingredients into the crock pot and give it a stir. Loosely place the lid on top or leave it off altogether. You do not want moisture to build inside. You want the mixture to reduce and thicken. Let it cook on low for 5-8 hours or overnight. You can play around with the spices to your taste but remember the flavors will get stronger as it reduces. This recipe makes about 4 cups. This recipe was adapted from www.tablespoon.com. I so have all of this in the pantry and will be making this TODAY!!! The Challah gets eaten as quick as I make it, so I guess I better get to the store and pick up some more eggs to make more Challah also! Previous Post Challah-My First Post-Happy New Year!